Please call members of both the House Agriculture and Natural Resources and the Senate Health Regulation committees this afternoon or early tomorrow morning and urge them to vote against these bad bills. Committee contact information is below. Telephone calls are best, but if you can’t call, please send an email. HB 457 (Fertilizer) and HB 13 (Septic Tanks) will be heard in the House Agriculture & Natural Resources Subcommittee on Tuesday at 1:00 p.m.
SB 168 will be heard in Senate Health Regulation committee on Tuesday morning at 9:00 a.m.
HB 457 is a complete preemption bill that guts water protection ordinances adopted by 40 local governments. Sets up a weak “model ordinance” as the most a local government can do even though it was written as a minimum standard. Since the weak model ordinance would apply statewide and no stronger ordinances could be adopted, water quality will inevitably suffer and clean up costs will be shifted to taxpayers. Localities have already adopted more stringent ordinances than the “model ordinance” and water quality has improved in those areas! Lawns are not agriculture. This is not about food production. But lawns do contribute to nutrient run off. The cost of removing nitrogen from Tampa Bay through storm water treatment projects ranges from $40,000-$200,000 per ton (according to the treatment method used.) Source control is the best (and cheapest) water protection strategy. Lawn care companies can still do business under the more stringent ordinances. They are free to apply iron, magnesium, potassium, compost based fertilizers, etc. during the summer rainy season. They can also do pest control and mow, trim topiaries, etc. These ordinances put no one out of work. The ordinances help Florida businesses. Many Florida fertilizer companies already offer “summer safe” products and Florida companies' products have gone from 2% of the market to between 70 and 90% of the market in areas with summer application bans. These companion bills eliminate the requirement for septic tank inspections every five years and also strike a subsidy to help low income property owners defray the costs of inspection. The original bill (SB 550) passed last year 76-37 in the House and 34-4 in the Senate. Grossly inflated projections of the cost of meeting water quality standards in other areas spilled over to include septic tank inspections which amount to about $122 a year (or 34 cents a day.) When the new legislature was sworn in, one of the first things it did was to delay the effective date of the septic tank inspection part of 550 so they could weaken or eliminate it during session. Inadequate treatment of sewage in septic systems can pollute wells and threaten public health. Older septic tanks were not constructed to current standards. There needs to be adequate dry soil between the bottom of a drainfield and the highest level reached by the water table. The recommended distance is 24 inches while Florida accepts 6 inches. This is too little to allow the aerobic bacteria to finish the job of treating the effluent from the drainfield. It is hard to believe that proper management of septic systems is not of paramount importance. The relationship between sanitation and public health is established beyond dispute. 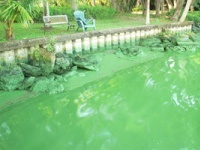 DOH estimates it will cost homeowners $614 for a pump out and inspection every five years. These inspections help homeowners by spotting problems before they get out of hand and cost thousands of dollars to repair. (Replacing a drainfield means digging up the entire area, removing the old drainfield material, bringing in new fill and gravel, laying new drainfield lines, and finishing with new fill and sod.) Septic tanks should be pumped out every three to five years to keep the entire system working properly whether they are inspected or not. Most Floridians are on some form of central sewer and pay far more every month than the inspection program will cost septic system owners. Why should septic system owners be exempt from responsibility for preventing their sewage from affecting their neighbors and community when everyone else has to do so? (Please call before noon)Tuesday, February 22, 2011 at 1:00 p.m.
(Please call Monday)Tuesday, February 22, 2011 at 9:00 a.m.